The Nilfisk Elite is the perfect vacuum cleaner when you need strong suction, excellent filtration, very good design and user-friendly features. Super cool machine features like the handle with remote control enables you to switch the machine on/off and adjust the suction level directly at the handle. With the Nilfisk Elite you pick up dirty air into the vacuum cleaner and with outstanding filtration, you exhaust clean air back out. Therefore not only cleaning our floors but the air you and your family breathe as well. The Nilfisk Elite series have been endorsed by the British Allergy Foundation with the 'Seal of Approval' for: House Dust Mite, Cat Allergen, Dog Allergen and Pollen. The HEPA filter should be positioned after the motor to ensure that the exhaust fan is releasing clean air. The HEPA filter component and vacuum cleaner needs to be completely sealed so that contaminated air cannot be released into the environment. Nilfisk calls this an airtight construction. A vacuum cleaner with an extra good HEPA filter is a bit more expensive than regular vacuum cleaners, but is a good investment for anyone who cares about the quality of their home environment. Extra high cleaning performance - Dust pickup on carpet an ‘A’ or ‘B’ rating and dust pick up on hard flooring an ‘A’ rating. This performance is achieved through optimization throughout the whole machine, without compromising on energy use and performance. Energy saving – with an Energy Class ‘A+’ or ’A++’ rating you will save up to 50% of power usage compared to other vacuum cleaners. To make it even easier to use, we have also fitted the Nilfisk Elite with click fit in the nozzle. If you want the best vacuum cleaner money can buy you should buy a Nilfisk Elite, because with its very good Danish design, high suction power, very good energy rating and excellent filtration you will never be disappointed. High dust pickup: A strong motor and a well-designed construction result in market leading dust pick up. Allergy filtration: Ultra dust bag, airtight construction, and HEPA H14 filter stops even the tiniest particles, animal hairs, dust mites, their droppings. All Nilfisk Elite models feature this as standard. Probably the best filtration in the world for household vacuum cleaners. Endorsed by the British Allergy Foundation. Energy saving – with an Energy Class ‘A+’ or ’A++’. Handle with remote control ensures on/off and adjustment of suction level directly at the handle. 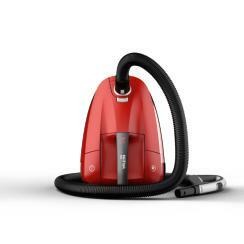 Silent: down to 68 dB(A) is very low for household vacuum cleaners. 5 years guarantee: The machine is built to last.